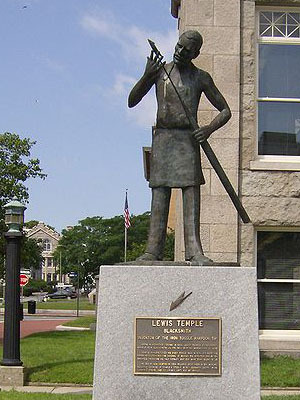 Statue of Lewis Temple, who invented the "toggle iron" and revolutionized the 19th-century whaling industry, in New Bedford, MA. Our list of publications provides guidance about recording and documenting historic ships and aids to navigation; laws, treatment standards, and compliance for any maritime resource; and submerged cultural resources. Maritime-related National Historic Landmark nominations provide contextual information about maritime heritage and history in the U.S.
Learners of all ages can enrich their understanding of U.S. history through maritime heritage and history. We have created a list of maritime-related lesson plans created by the Teaching with Historic Places Program. These lesson plans are geared toward K-12 students.